WiiU Nintendo Network Details – getting a Nintendo Network ID! The WiiU launches in less than 24 hours. Learn a little bit about the network that will be built from the ground up to start competing with Xbox Live and the PlayStation Network. Posted in Video of the WeekTagged NintendoLeave a Comment on WiiU Nintendo Network Details – getting a Nintendo Network ID! Was this a disappointing year for E3? Over the last several years, E3 has tried to return to its rightful place as reigning champion of video game conventions, and although PAX has stolen some of their thunder, E3 (the Electronic Entertainment Expo) has done a very good job of revitalizing what they began. This year was lacking the big shock of new console announcements. It wasn’t just a rumor, it wasn’t “we have it on good authority” – it was a known commodity that Nintendo’s WiiU would be talked about, because it had already been announced. But rather than give us a ship date or price, rather than tease us with something we’ve been wanting for over a decade (Killer Instinct 3, anyone? ), we got some cute mini-games and a sneak pack of a Wii U dressed in black. The Sony conference plugged a new God of War, talked at lenth about WonderBook, then rang the death knell for the PS Vita by not announcing a price cut. Microsoft impressed a few people with Halo 4’s story intensive trailer, and at least they didn’t announce a new product to compete with the 3DS or the PS Vita. Microsoft had the coolest “previously unannounced” (although leaked) item in the presentation, SmartGlass. SmartGlass is an enhanced offering of the Xbox Companion App for Windows Phone 7 and Windows 8. So, no, it wasn’t amazing or jaw dropping… but, there are some exciting things happening in all three camps. I’m not a huge fan of Wonderbook, but the idea can be expanded upon and will find a niche – it may even encourage some people who dislike reading to get more interested in the written word, in the same way that e-books have ignited interest among young tech enthusiasts. No, it wasn’t the most exciting year for E3, but I’m confident that it wasn’t even in the top ten when it comes to “the worst.” I’m fairly pleased with what we’ve got to look forward to, and if you’re not, then I encourage you to go back and re-watch some of the pressers(Nintendo, Sony, Microsoft) and pick something out to enjoy – it’s not all bad news! Nintendo unveiled the new DSi, and more! In a recent press conference, Nintendo confirmed the rumors of the new Nintendo DSi, along with plans to price it at a low $179. They have intentions of releasing it as early as November 1st in Japan (it is implied that it will make it to the U.S. just as early, and debut in Europe Spring 2009). My favorite announced feature so far? A built-in web browser. 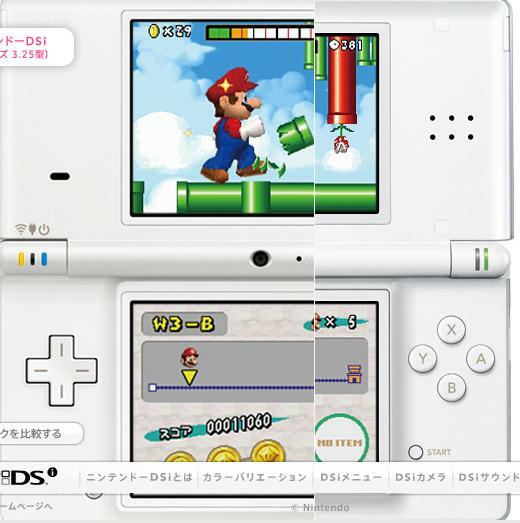 Other features include a new online DSi Shop, a .3 mega pixel camera (seen on the hinge above), 12% thinner than existing models (as partially demonstrated above), 3.25 inch screen and “better audio capabilities.” Sadly, to facilitate this slimming down process, they will remove the Game Boy cartridge slot. In additional news, Nintendo has been considering the lack of storage on the Wii for quite a while. How do they combat this? Sure, there is a model of Xbox 360 sold without a hard drive, but if you want it bad enough, you can buy a new hard drive and fix the problem yourself. No such option exists on the Wii. With the recent announcement of the Marriott In-Room Entertainment allows users to select multiple games without swapping discs – suggesting the storage problem was solved. According to Kotaku, users will be able to save their downloads directly to an SD card, without having to make the stop on the console in the middle. It will only apply to content downloaded from the Wii Shop channel and other similiarly designed channels in the future, but it’s a step in the right direction. Keep in mind, however, that the biggest downloaders still may have to swap out their CD-Cards, as the console is not officially compatible with SDCards over 2 GB. Posted in Gaming, NintendoTagged DSi, Nintendo, Wii1 Comment on Nintendo unveiled the new DSi, and more!